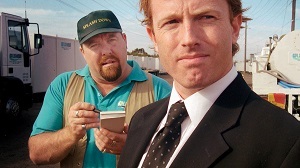 There has been a dearth of quality home-grown comedy for the screen in recent times – 2005’s Look Both Ways, The Proposition, Peaches and Wolf Creek could hardly be described as light-hearted, and this year’s Jindabyne, 2:37 and The Caterpillar Wish continue the focus on the dramatic. Attempting to arrest this trend with a mockumentary about a heroic portaloo plumber are the truly brave Jacobson family, whose Kenny may well be the funniest Australian film since The Castle, the last truly successful Australian comedy for the screen. Played with charm and perfect timing by co-writer Shane Jacobson, Kenny is the personification of optimism, a modern Atlas who bears the burdens of his chosen career with a smile and a wry wit that is an inspiration to those who think their work can be tough. For what could be more difficult than trying to protect your portaloos from a drunken mob determined to set them on fire? Or attempting to remain cooperative and graceful when festival patrons continually want to have a crack at you, and all you’re trying to do is provide them with a clean and safe environment to perform their necessary ablutions? The magic of Kenny is in his drier-than-dry approach as he discusses his work in the most straightforward and brutal manner that turns several moments into comic highlights. Kenny’s frankness may offend some people – it would be advisable for those easily bothered by discussions of defaecation to save themselves the trouble – but for anyone with a sense of humour about such matters there is gold in the turns of phrase. The script zings with unexpected moments of hilarity, in which Kenny will use a particular colloquialism or idiom that perfectly matches its need, and yet is probably being voiced for the first time ever on screen. Kenny is brilliantly portrayed, however there are times early in the film when his story seems somewhat aimless; the introduction of several key characters in the middle stages does partially correct this anomaly. The Jacobson family are able to reveal far more of their titular hero through his responses to several challenges to his formerly stable and settled existence: his father’s illness, an eye-opening and career-changing conference, and a possible new romantic interest. Kenny is a very funny and well written caricature until these moments give him the depth of character he deserves. Although there are sections that don’t quite work, the overall success of Kenny lies in the polished script and brilliant performance of its leading man, who makes Kenny such an heroic figure he must surely win over the hardest of viewers. His determination to do the best for himself and his family makes him an inspiration, and his self-acceptance and self-deprecatory wit allow him to become the audience’s mate, which is a powerful combination in a film so heavily reliant on one character. There is absolutely the sense that one wants this man to achieve his dreams. For anyone desiring a relaxing and amusing slice of Australian life without the darkness, perversion and murder so commonplace in our recent offerings, the story of a “glorified turd-burglar” may be just the ticket. This entry was posted in Film Reviews and tagged Comedy, Mockumentary by Mark Lavercombe. Bookmark the permalink.